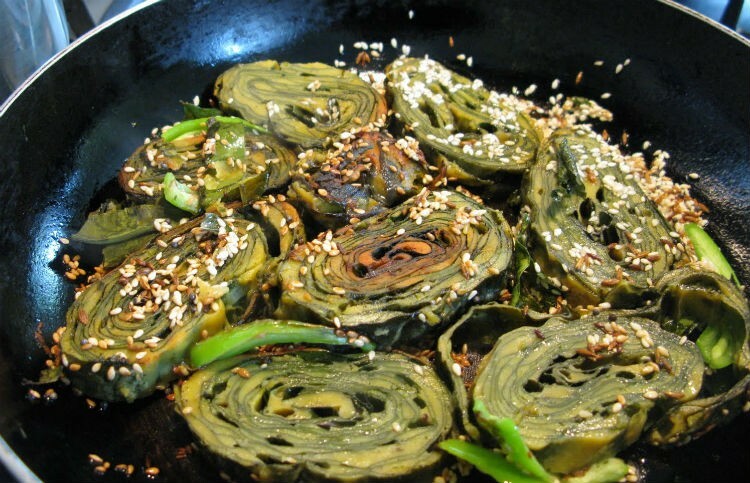 Paatra or Gujarati Patra is nothing but Fried Colocasia Leaf Rolls. Popular in Surat and other parts of Gujarat, it is either steam cooked, deep-fried or shallow fried and served either as an appetizer or as an evening snack. Wash the leaves and pat dry. Scrape off the thick stems and veins taking care not to cut the leaves. Mix the tamarind pulp, gram flour, jaggery, asafoetida powder, red chilli powder and salt to a thick, smooth paste. Place the leaves on a flat surface. Brush/Smear them with the prepared paste and stack them one on top. Roll them tightly and tie with a cotton string to secure them in place. Steam cook the rolls for 30 minutes. Remove and allow them to cool. Cut into 1/2 inch thick slices. Fry the mustard seeds and sesame seeds for 30 seconds. Remove and pour this over the patra. Garnish with grated coconut and coriander leaves, if desired. Feel free to comment or share your thoughts on this Patra Recipe from Awesome Cuisine.